Steve Riley and I have added some photos to the Helsby Flickr Site as below. They hopefully go somewhere to showing how honoured and happy Joe is plus the excitement and warmth that the whole of Macclesfield and Joe’s family and friends showed. I’ve added the name of the photographer although the better ones of mine were actually taken by Bill, so thanks to Bill for those. Also available, and I presume for a limited time only is Joe’s TV appearance! It’s on i-player link below (but you may need Adobe Flashplayer installed to watch it). Joe’s on at about 25 minutes in and you can fast forward if you need too. Big thanks to Chris Ashbrook for downloading Joe’s live run and allowing the world to view it on youtube, I’m sure I’m not the only one who has now watched it numerous times! Thanks to everyone who has commented on the blog, one highlight for me was knowing Andy Smith was watching live in Australia. The world is a large place but people like Joe do their part for making it smaller and better. If you haven’t commented on the blog then please do. I was going to write a short account of the day but decided after reading some words Mario wrote that they summarise the day fantastically and I’d be unable to add more. I’m glad so many were able to share the day and it was fabulous to meet all of Joe’s family and his sister Doreen who does as much as Joe in her own wayfor he community! So in the words of Mario…. ‘twas the year that Joe with His torch would appear. Where Joe would proceed with His pattering feet. Who throughout all the years Joe would have given His aide. He must have felt like the proudest man in the land. If you do watch Joe then please comment on the blog! This entry was posted in Uncategorized and tagged 31 May, cheshire, frodsham, helsby running club, joe beswick, macclesfield, olympic torch, torch run. Bookmark the permalink. Just been watching Joe live on the BBC live feed whilst in Oz. Brilliant ! No amount of rain was going to wash the smile off Joe’s face. Looks like an excellent day out, only regret I couldn’t be there to enjoy the fun. WELL DONE JOE !!! We went to Macclesfield and saw the relay. We didn’t know who the runner was until we looked him up when we got home. 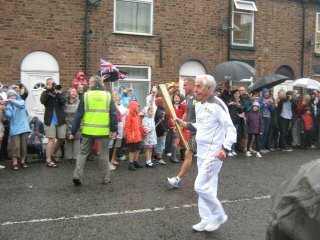 My 16 year old daughter was delighted when he ran past because he looked as if he was enjoying it so much. I have sent a photo to your club email address. Thanks very much for the picture Alison – I’ve added it to the story (hope that’s ok!). More from us when we can get them off the camera! Well done Joe!! Sorry I couldn’t be there today, looks like you all had an amazing day! Great day, such a great heart-warming special day, hadn’t realised how far Joe had to run! We all have so many fabulous memories of the day now that we can treasure. Loved Joe’s stories of the day in the pub afterwards too, and what a lovely family. You were there in spirit Andy. Perfect! Joe’s Moment To Shine – and how he shone! He came, we saw and he definitely conquered! Only disappointment for me was having to miss the follow-on in the pub afterwards but nothing could detract from what was a fantastic day – an uplifting slice of history in every respect. Thanks Joe – THE BEST. Absolutely brilliant Joe.Nobody deserves the honour more than you and the smile on your face is priceless!! I saw Joe carry the olympic torch ,I was privileged ,,I ve seen marvelous footage of Joe’s run on you tube and along with this I seen the flame .But most strikingly humbling and memorable was the way in which Joe passed the olympic flame on ,it was wonderful, and gives insight as to champions .